With the launch of World of Warcraft: Battle for Azeroth, we’ve updated Class Trials for level-110 characters. Now you can try a class in the expansion before you boost! On the character-creation screen, players who have the World of Warcraft: Battle for Azeroth expansion can now create and play a level-110 “Class Trial” character with a preset class specialization. You’ll take this character through a tutorial experience and get a chance to play through the Siege of Lordaeron event, gain your new Artifact neck piece—the Heart of Azeroth—from Speaker Magni, and experience the introductions to Kul Tiras for Alliance characters or Zandalar for Horde characters. After that, if you’d like to play the class further, just apply a level-110 character boost to continue your adventure. Whether you’re Horde or Alliance, you’ll begin your new adventure on a gunship high above Seething Shore. Your new trainer will guide you along the way as you become familiar with your new class, providing you with opportunities to practice against several enemies. Once the experience has been completed—or at any time during the Class Trial—simply apply a level-110 character boost* to continue your journey in Battle for Azeroth. If you’re undecided, you can also keep the character around and apply a boost later, or delete it if you want to make room to try another class. Please note that if a character completes the Class Trial experience but is not boosted, it will be locked and unavailable for play until a boost is applied. While there is a limit on the time you’ll have to play through the Class Trial, you can log out of the character and continue the experience later with the time you had remaining. You’ll also be able to try multiple classes, and won’t be locked into only one Class Trial. 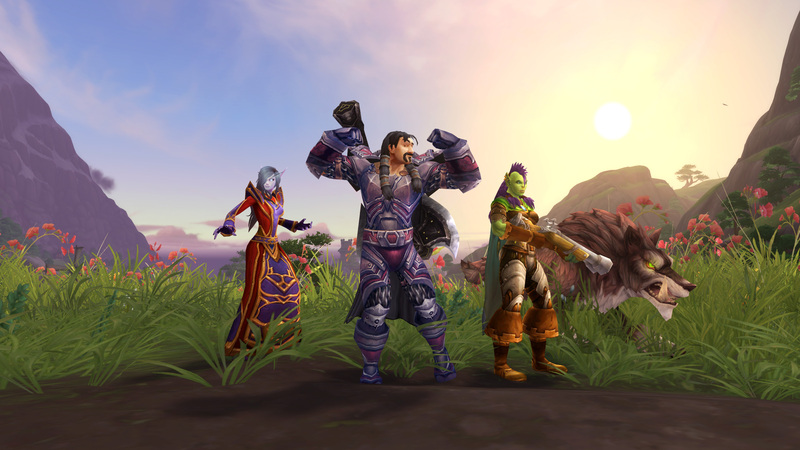 Whether you’re already one of Azeroth’s protectors, returning for the new expansion, or a new player joining friends, the Class Trial experience provides an opportunity for Battle for Azeroth players to find the character that’s right for them. What are you waiting for? Take the plunge into the latest adventures in Azeroth! *One level-110 boost is included with Battle for Azeroth, and additional character boosts can be purchased in the Shop.